Big Bazaar Xiaomi Redmi 5A Cashback - Big Bazaar has Partnered With Xiaomi India and Offering The Huge Discount On This Indian Republic Day On 26th January 2018. 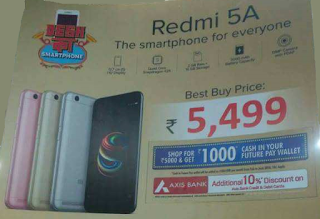 Users & Purchasers Will Get The Total Discount Of Rs.1600 On Purchase Of Redmi 5A From Big Bazaar. The Original Price Of Redmi 5A is Rs.4999 & Rs.6999 Respectively for 2GB & 3GB models on Flipkart. 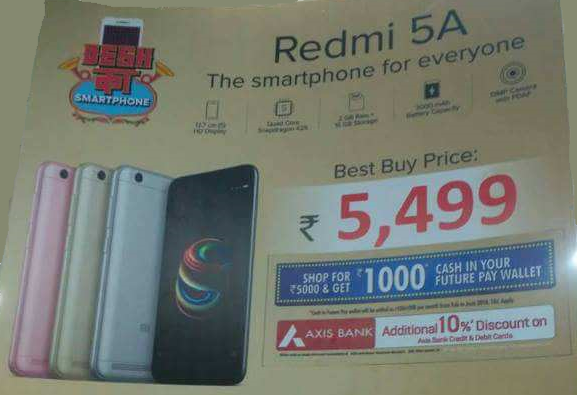 How To buy Redmi 5A at just Rs 3900 from Big Bazaar ? Offer is valid from 22nd To 28th Jan 2018 (“Offer Period”). Users will get 10% Discounton purchase using Axis Bank Credit And Debit Cards in Big Bazaar outlets. Offer applicable on minimum purchase of Rs.4500 in single transaction, with a maximum cashback of Rs.500.